Utagawa Kunisada/Toyokuni III (1786-1865) Battle Tales of the Han and Chu: Fan Kuai, 1827. Oban. This is an outstanding and rare print… one of only a handful of woodblock prints from Edo that are really significant in establishing new genres and changing the course of art. I wrote in detail on the pedigree of the musha-e genre that is attributed to Kuniyoshi - the single sheet, polychrome warrior print - on our Wordpress Blog in 2011. Kunisada was the most prolific of all the ukiyo artists yet despite his output, only a handful of true warrior prints are known to exist. Horst Graebner’s catalogue raisonné lists only 50 in total from throughout his career. That this print is from the mid 1820’s adds to the rarity and also the academic importance of the piece. Kuniyoshi became famous for his ‘innovation’ of the single sheet oban musha-e with the publication of his 108 Heroes of the Popular Suikoden in 1827. At the time, Kunisada was already a prosperous artist whilst Kuniyoshi had resorted to selling tatami mats to make ends meet. When the opportunity arose, it is inconceivable that Kuniyoshi did not use the few prints from Kunisada’s earlier series as a model for what was to become one of the most celebrated series of warrior prints. The complexity of influence does not end there since Kunisada altered his habitual Utagawa School style and adopted a drawing style from another contemporary: Shuntei Katsukawa. This astonishing print, almost indistinguishable from Kuniyoshi’s later series, uses exotic Chinese stories as its model, a theme picked up by Kuniyoshi’s publisher in the famous Suikoden (Water Margin) series discussed above. 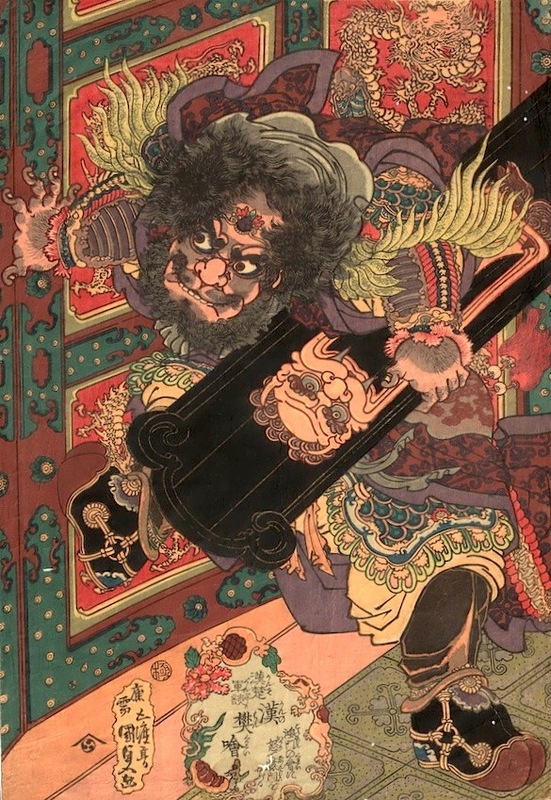 Kunisada and his publisher were no doubt responding to the contemporary vogue for exotic Chinese legends that dealt primarily with duty, love, loss and revenge. These fearsome and grotesque stories would have chimed with the robust and masculine culture of a restive populace hungry for change and escapism. In these pieces, the ukiyo-e artists were reflecting so much of the 'male journey' of the times. Noted Kunisada scholar, Sebastian Izzard illustrates this print and discusses the series (six are known) at length in Kunisada’s World, p 107. He says of this piece. Fan Kuai came from a lowly background. He was an early follower of Liu Bang and when the latter became emperor, he was appointed minister. In 196BC, suspecting a plot against the emperor’s life during a banquet, Fan stormed the dining hall, carrying part of a screen under his arm as a shield, the incident shown in this print. After eating and drinking to excess, Fan feigned drunkenness and upbraided the plotters, allowing the emperor to escape. Kunisada based this robust design on a print of the same subject by Shunei. A hirsute and bug-eyed Fan, dressed in lamellar armour and carrying a panel decorated with a demon mask, kicks in the door of the banquet hall. 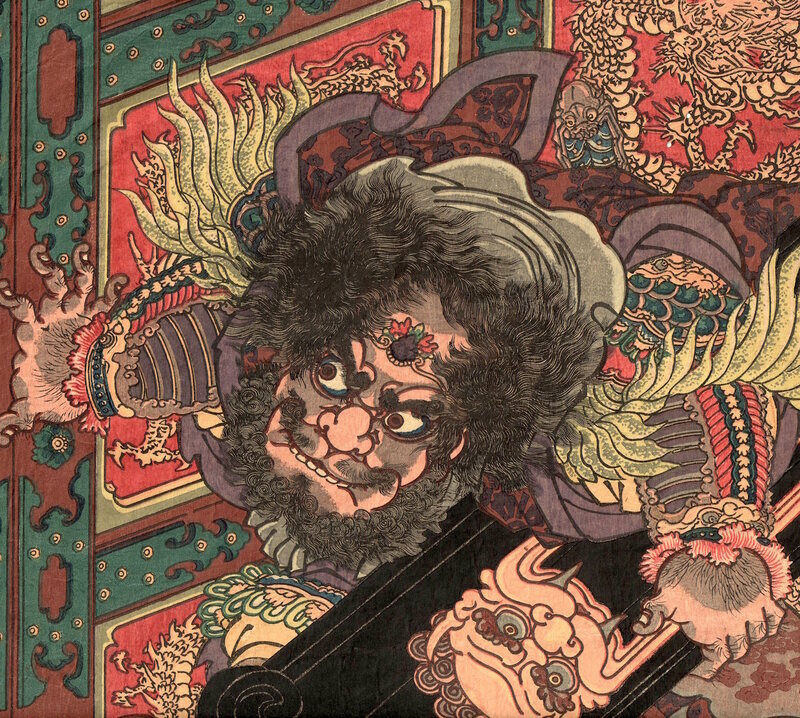 Compared to the earlier Shunei version, Kunisada’s print has a vigorous energy typical of this series. The print is in fine condition, with an outstanding colour and impression. Unusually, full size with only minor pin holes and damage. The print is illustrated in Izzard, Kunisada’s World, plate 43/2.